All true tektites will have a source crater. Why? Well tektites are siliceous melts - the material is proven not to be in-situ and therefore has to be ejected from a crater. When it comes to some impact-like glasses then the possibility remains that they could be the result of heating from an aerial explosion (like a larger Tunguska), thus leaving no crater. So, given the number of known impact craters, how come there are not more tektites? Tektites formation requires a sizeable impact, forming a crater in the kilometer to tens of kilometer size range. The crater must form in an area containing silica rich sediments or meta-sediments, such as a continental shelf. An impact into a silica-poor rock will not form silica-rich tektites. Finally, when dealing with older craters the tektites are simply lost to geological time. Tektite glass is unstable over long periods of time, particularly when exposed to water. The glass will simply dissolve away or devitrfy. After 30-60 million years it's really requiring exceptional circumstances to preserve a tektite, and even then there is limited surface exposure of rocks of the correct age. How do we link a suspected crater to a tektite strewnfield? Firstly we need to prove a suspected structure is indeed an impact structure. Many circular features are wholly terrestrial in origin. We need to find tell-tale signs like shatter cones, coesite / stishovite, planar deformation features, geochemical indicators, etc. Once the crater is confirmed, assuming the target rock is of the correct composition, it might be possible to associate it with a tektite strewnfield. This would be done on the basis of relative proximity; age of the tektite and crater and definitively by geochemical comparison of the source rocks, melt rocks in the crater and tektites which should provide a unique fingerprint. Not all impact craters produce tektites. Georgiaites and Bediasites were produced by the 40 km diameter (estimated post-impact size) Chesapeake Crater, which formed 35.5 million years ago. To make a tektite the target rock must be of suitable composition, i.e. silica-rich. Silica-rich rocks are typically formed by erosion and deposition that concentrates silicates into sedimentary rocks like sandstones, siltstones and shales and their metamorphic equivalents. For this reason, impacts into continental shelf regions are particularly suitable to produce tektites. ABOVE: The position of the Chesapeake Bay Impact Crater (red) and tektite distribution (blue). Tektite distribution is largely controlled by the outcrop pattern of strata of the correct age. 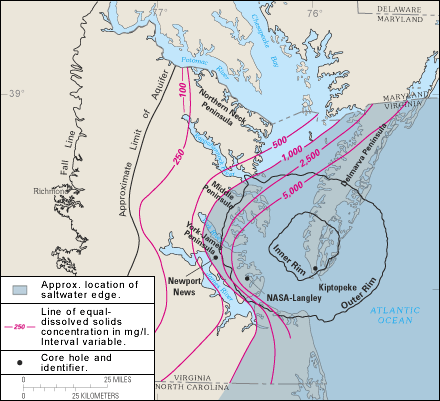 ABOVE: Boundaries of the Chesapeake Bay impact crater. Source: Wikipedia. Adapted from USGS website. [http://pubs.usgs.gov/circ/2003/circ1262/]. Central European tektites were ejected from the 24 km diameter Ries impact crater in Germany 14.34 (±0.08) million years ago (Laurenzi et al., 2003). ABOVE: The position of the Ries Impact Crater (red) with associated smaller Steinheim Crater to the west and tektite distribution (green). 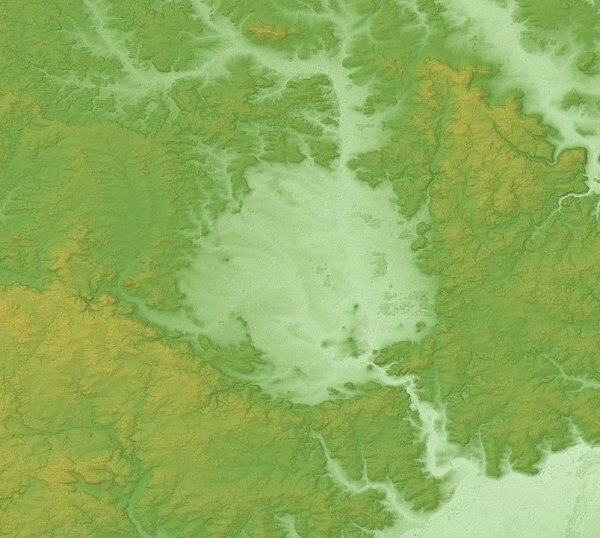 ABOVE: Relief map of Nördlinger Ries, Germany. From Wikipedia. Data from "SRTM-1 (30m Mesh) Ver.3 2014". ABOVE: The position of the Bosumtwi Impact Crater (red) and tektite distribution (pink), no tektites at white localities. ABOVE: Lake Bosumtwi, Ghana, view from Southwest. Bosumtwiis a lake-filled impact crater, about 10.5 km in size an 1.3 million years old. Vertical exaggeration 3x. From Wikipedia. Created with NASA WorldWind by User: Vesta using Landsat 7 (false color) satellite image. A suggested, but unconfirmed, source crater is the 12-14 km Pantasma Crater in Nicaragua, around 540 km from the suspected centre of the Belize tektites (Povenmire et al., 2011). ABOVE: The position of the Pantasma Impact Crater (red) and tektite distribution (smaller red dots). ABOVE: Pantasma Impact Crater as viewed on Google Earth. Tektites, particularly when exposed to water, devitrify and dissolve over geological time. Depending on geological circumstances this can happen very quickly or slowly. After 30-60 million years the majority of tektites have been destroyed. Pseudomorphs may remain. ABOVE: The position of the Darwin Impact Crater (red) and impact glass distribution (greenish yellow dots). White crosses are where impact glass is confirmed as absent. The distribution somewhat follows drainage channels. The red line is 10 km to give a sense of scale. ABOVE: The 1.2 km diameter Darwin Impact Crater as viewed on Google Earth. The largest and one of the youngest tektite forming events has no known source crater. This has sparked some wild theories. They range from placing the crater thousands of kilometers beyond the strewnfield, asserting that there is no crater or a number of smaller craters or raising even crazier conspiracy theories. I believe I have strong leads as to where the source crater lies, as you'll see in subsequent pages. In truth the reason why a crater has not yet been found / proven is likely much simpler. Firstly the crater is not on land. 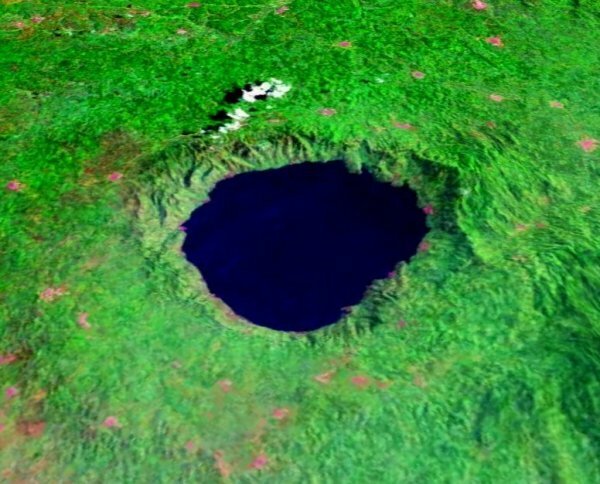 If it were then we would know about it: It would be a 40km diameter, 1 km deep, hole in the ground - almost certainly a circular lake in the tropical and sub-tropical environment. Erosion, simply could not remove enough sediment (with effects reaching down 10 km into the crust) to hide this feature within 0.876 Ma (+/- 0.002 Ma) (Mark et al., 2017). So, the crater is in the sea - evidently on a continental shelf (and not deep sea) in order to produce tektites. Many independent studies point to an area in central Laos (to the west) extending to the central Gulf of Tonkin (to the East). And what do we have in the Gulf of Tonkin? We have the Song Hong Basin if you're Vietnamese or the Yinggehai Basin if you're Chinese. This is a pull-apart basin with exceptionally high sedimentation rates: Rates more than sufficient to entirely bury an impact crater of this size. Hydrocarbon exploration has taken place over this region, so theoretically we should have a reasonably well investigated basin. This is true, but now throw in the disputed Vietnamese-Chinese Maritime border on top of the typically high confidentiality levels within the oil industry and we have a problem. Look at the Chicxulub Crater: In 1951 the crater was drilled and discovered andesite, misinterpreted as a lava dome. In the 1960's a gravity map suggested an impact crater to contractor Robert Baltosser, but he was forbidden to publize his conclusion by Pemex. In 1978 magnetic surveys also indicated an impact crater. Pemex disallowed release of specific data but they were able to present thier results in 1981. It was then not until 1990 that drill samples were secured that showed shock metamorphism, proving an impact event. So where are we at on the search for the Australasian tektite source crater? Well, we are at the stage where we have a possible circular feature on gravity data of the right size and in the right place. There are seismic lines crossing this feature, but they are confidential. The few published lines are placed off-structure and are of low resolution, one low resolution line cuts the margin of the structure. There is a glimmer of published data indicating that seismic lines exhibit chaotic sediment in the late Miocene to Plio-Pleistocene layers at this gravity anomaly. Wells have been drilled nearby, but none drilled in the gravity anomaly. The feature is in a disputed maritime region and there appears to be a wall of silence from oil company representatives, either indicative that the suggestion of an impact crater is 'crazy-talk' or that they are not permitted to discuss / release such data. There is no conspiracy, it is simply a matter of guarding costly confidential data that has possible economic relevance to a disputed maritime border. At the end of the day we know there is a c. 40 km diameter crater out there - it's just that we have a fair amount of circumstantial evidence and no solid evidence publically available. Watch this space - it might take another 20 years, but the crater will eventually be proven, if not precisely here then very close by. ABOVE: A gravity anomaly that may be consistent with the Australasian Tektite Source Crater. Source: WGM2012 from Geo-MapApp (http://www.geomapapp.org), overlain on Google Earth. After Whymark (2018).